365 Swims has reached the half-way point: this caper started on 1 June 2012, so if my calculations are correct there are only 182.5 swims to go. Easy. It won’t get cold again til April or so, by which time I’ll be counting down the last 60 swims. Too easy. The Half-Way Week had plenty of variety. ‘Snorkelled at Jawbone Marine Sanctuary on Saturday, Sunday and Thursday. Hardly any fish, but it’s always cool and peaceful. ‘Saw a small banjo shark in the shallows at Willi beach on Wednesday morning. Banjo sharks are also known as fiddler rays and banjo rays. I reckon they have the head of a stingray, the tail of a shark and the colouring pattern of, almost, a giraffe. Talk about an identity crisis. 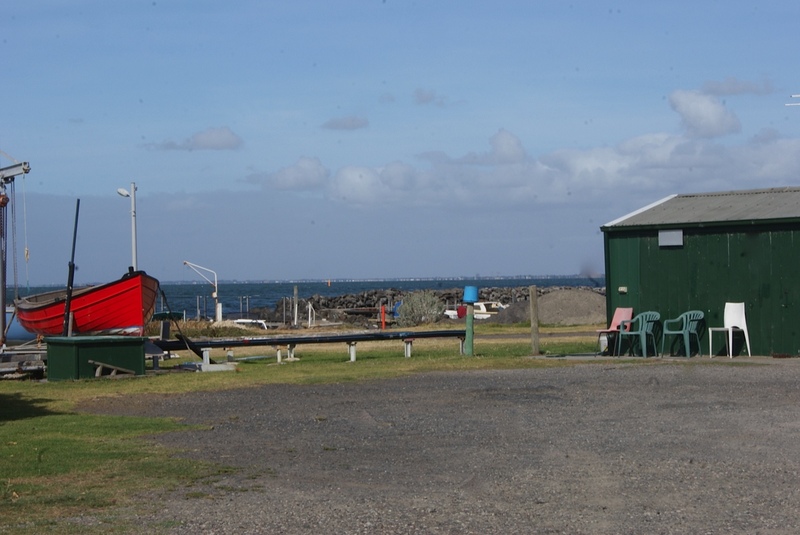 This strange vessel turned up at Willi beach on Wednesday morning. Mysterious at first, by day’s end the riddle was solved. A new marker. The new marker has buoyed the spirits of the serious swimmers. No need to worry about the yellow buoy near the angling club floating away anymore. 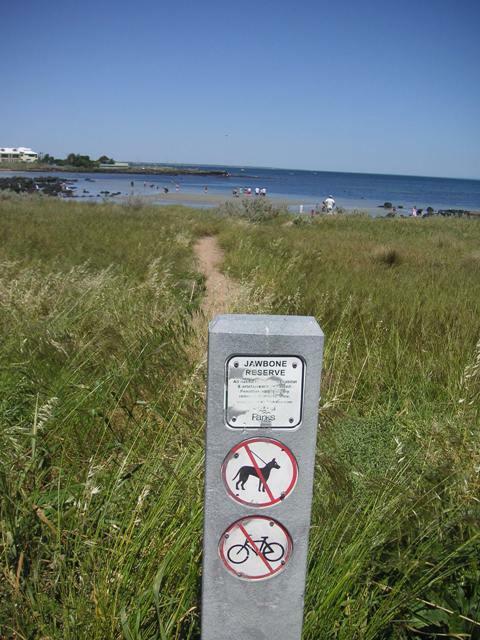 There’s now a large yellow marker with a sign and a cross, a solid post for all to see: swimmers, anglers, and %^&*% jet-skiers. 39 Degrees. 5pm, 29 November. Several hundred reasons for swimming at 6am. Serious heat arrived on Thursday. Thirty-nine degrees heat. Snorkelling at Jawbone was a relief – from the heat, and from the crowd at the beach. 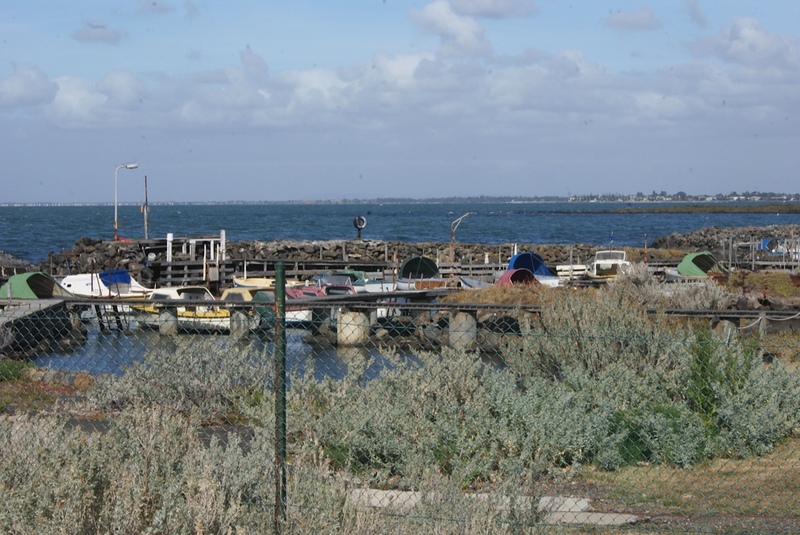 At the end of Bayview St, between the Williamstown swimming beach and Jawbone Marine Sanctuary, is this private fishing harbour. It’s a world unto its own. A step back in time. You don’t see many people here but you’ll see plenty of pelicans when the boats come in. And a few weeks ago a seal was lolling about on its back. 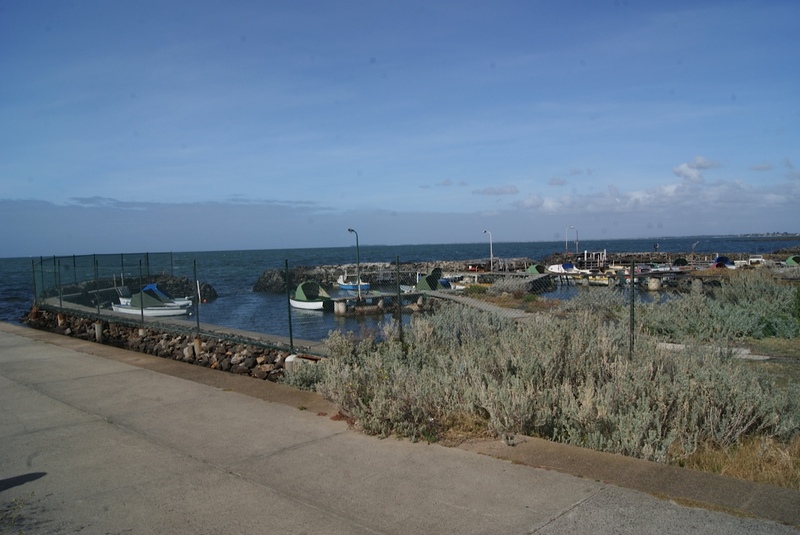 Who built the harbour? And when? And how did they get around local council by-laws? 365 Swims might need to visit the local history society. Or chat to some old salts. On the bike path between the fishing harbour and Wiliamstown High School’s Bayview St campus is this re-production of a painting by noted Australian artist John Perceval. 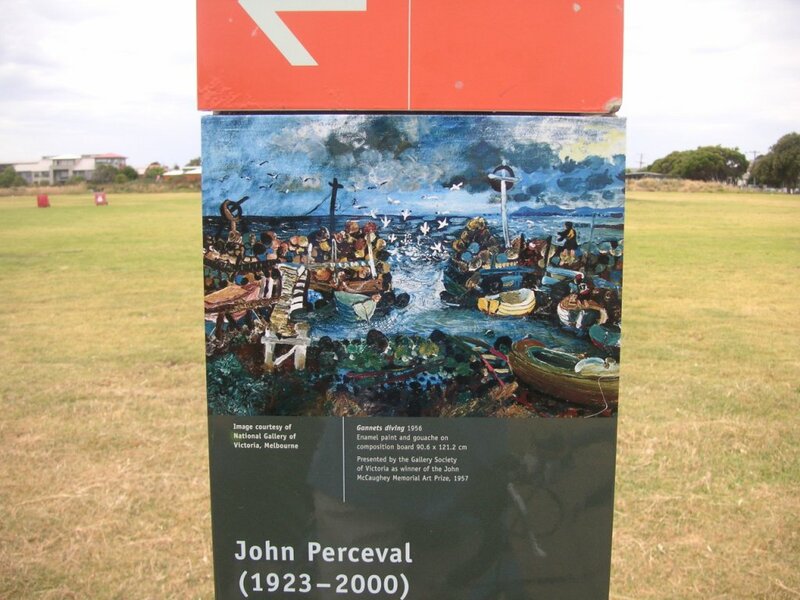 The painting, the Hobsons Bay history marker tells us, is one of a series of seascapes Perceval painted in Williamstown in 1956-57. He painted another Williamstown series ten years later. John Grieve, who kindly took the three fishing harbour photographs, gets down to the beach very early for his daily dip. Then he heads off, more often than not, to play croquet. In the winter he barracks for Williamstown, from the Morris St ticket-box half-forward-flank. 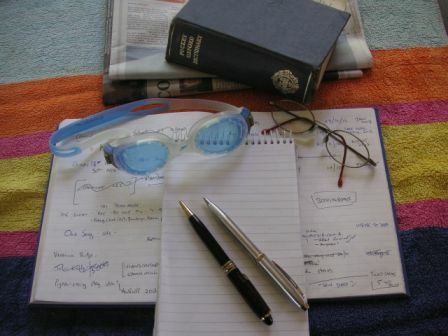 Swimming, like writing, is all about rhythm. Kevin Moran, one of the Willy Dolphins, is a distance swimmer, so he knows a thing or two about rhythm. He’s also the Willy Dolphin’s poet laureate. At the past two Christmas breakfasts he’s entertained the Dolphins with a poetic account of the year’s characters and some of their antics. Here is his poem from 2010. A handful of people gather, whom some folk think are queer. They walk into the cold waters down at Port Philip Bay. When all these fearless swimmers, are seen in full flight. The passer-bys say hello, but they all have curious smiles. That brought them notoriety for their morning caper. With Teresa, Pam and Paul making up another three. While Andrew, Lester and Michael make up another band. And on a Thursday and a Friday, Kevin you will find. Lester confronts one and all to ascertain their views. And hope that their towel stays, wrapped around their hip. So now that it is Summer, a bigger crowd may be expected. Kevin Moran has been a keen swimmer for all his life and took up open water swimming five years ago. Twice a week he drives from Essendon to Williamstown ( a 20 minute drive) to swim with his Willy Dolphins colleagues. It’s a gorgeous spot that was pretty much inaccessible before the old rifle range was developed, 20 years ago, into the Rifle Range Estate. You pedal through modern suburbia – brick houses jammed up together like sardines in a tin can – and then you’re on a little beach, in a little oasis. Here’s hoping there are a few more fish for The Great Victorian Fish Count in a few weeks’ time. It was fun last year. Lately, on Saturday mornings, there have been groups of triathlon swimmers hitting the water at Willi at seven on a Saturday morning. Twenty or thirty of them. Wearing wetsuits. A blackness in the water. ‘Rubber men,’ says Tom derisively. Then he wades out in his bathers and with his labrador Kimba (president of the Willy Dolphins). 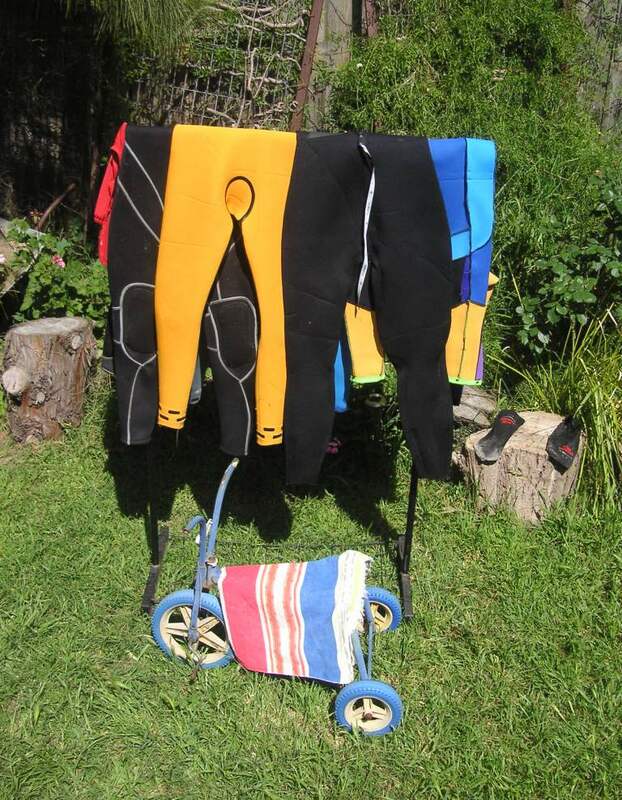 I save my wetsuits for the hot days, for snorkelling at Jawbone Marine Sanctuary. My wetsuits are my sunblock. And my protection from rocks and ‘rays. Any day now I’ll get the wetsuits from the garage. And the flippers. And the gloves. And the earplugs. And the snorkel.